Around Wovember 2012 ago I was introduced to spinning by my comrade in wool Felicity ‘Felix’ Ford. 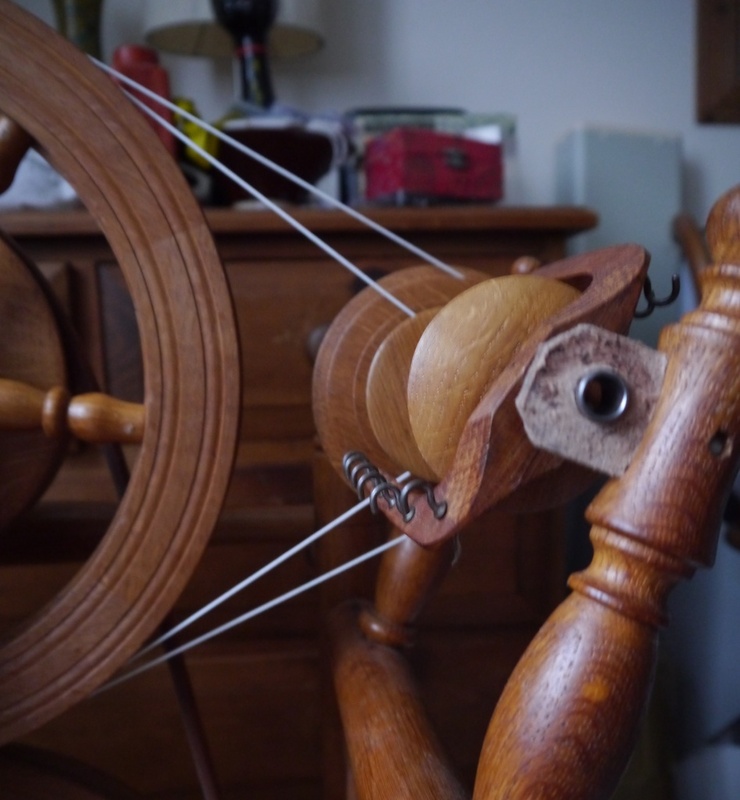 I started off with a drop spindle, and soon got caught by the spinning bug. It was not long before I started dreaming about spinning wheels. As is my nature, I started reading up on them, and I soon realised that if I wanted a decent wheel I could afford, I would be best off getting a second-hand wheel from a good make. And when it comes to good wheels, it would be hard to beat a Timbertops. This make just kept popping up in on-line forums, and I decided I would hold out until I would find one for sale. Timbertops Wheels were originally made to order by husband-and-wife team James and Anne Williamson to exacting standards. Last summer my patience was rewarded. The East Sussex Guild of Spinners, Weavers & Dyers had an original Timbertops Chair Wheel for sale. 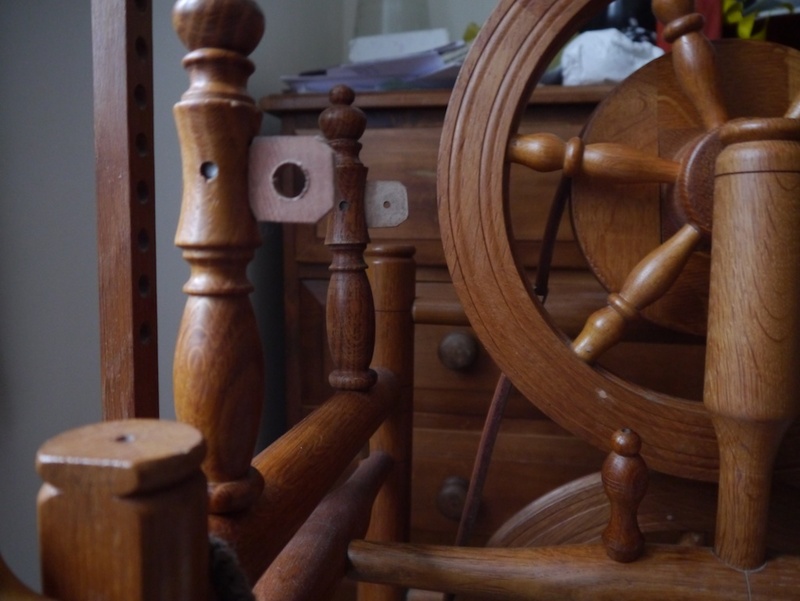 This model of spinning wheel was supposedly originally made by using the frame of an old chair, and appears to be more common in the USA than in the UK. As you can imagine, the footprint of this wheel is rather small, which was perfect for my one-bedroom flat. So it was with much excitement I went on a road trip with my friend Sue to collect the wheel in The Garden of England (as the county of Kent is known in the UK.) Kent didn’t disappoint, and we kept finding ourselves travelling down smaller and smaller roads, in increasingly beautiful and bucolic surroundings. Eileen, the seller of the wheel, had given us very good directions, but just in case we miss it, she put up a sign for us at the last turn. A sign pointing towards my spinning wheel! Over a cup of tea, Eileen told us the history of the wheel. She purchased the wheel from Jim Williamson at Timbertops about 25 years ago when she and her husband moved to the country and purchased a few sheep to keep the grass in the paddock down. It was one of the first chair wheels that he made and he fitted a maiden on the right hand side so that left or right handed people could use it by swapping the flyer assembly over. The wheel was in good condition but Eileen hadn’t used it for about 10 years, as she has developed arthritis nearly everywhere. Consequently her hands and back play up very badly if she tried to sit and spin. Although Eileen can no longer spin, her hands are not idle, and she showed us some beautiful knitting and quilting pieces she was working on. The chair wheel is a spinning wheel with a double-treadle, and it has not one, but two fly wheels placed one above the other. the treadles drive the lower wheel, which in turn accelerates the upper wheel by means of a leather drive-band. The upper wheel in turn drives both the flyer and bobbin, as it also has a double-drive. In addition, it has two mother-of-alls, one on the left and one on the right. This means you can have the flyer assembly on either side of the wheel, and as I’m left-handed I prefer it on the right-hand side. This wheel doesn’t do things in halves! The wheel has been turned from oak, and the attention to detail is superb. Everything is in proportion, and I particularly like that the orifice hook has its own little home next to the upright of the upper wheel. I was very lucky to also get a skein ‘unwinder’ (for want of a better word), a lazy kate, and twelve bobbins, all made by Jim Williamson. The right mother-of-all, with the flyer assembly. 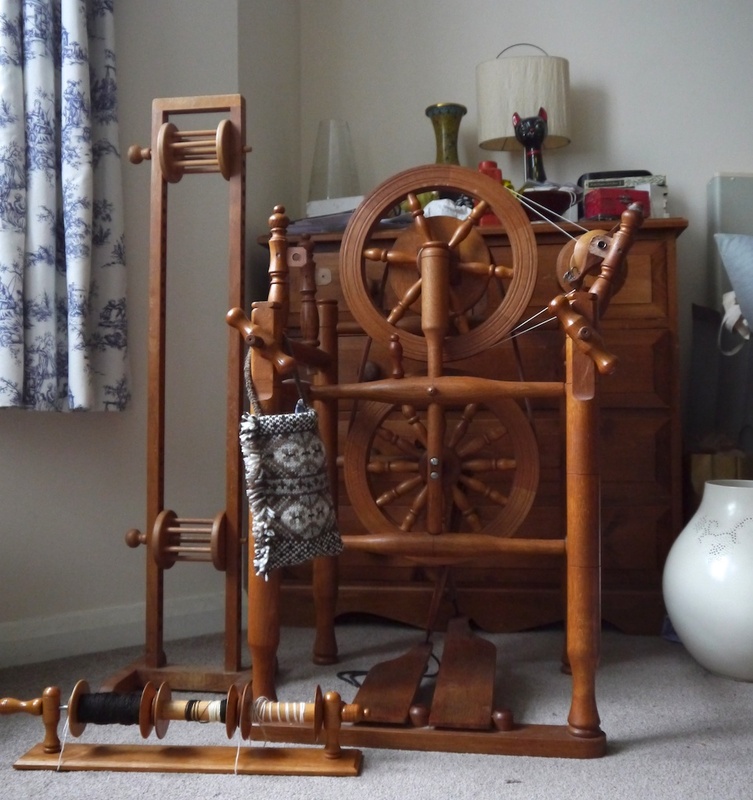 As the wheel was missing one maiden (one of a pair of small upright ‘sticks’ with leather bearings that holds the flyer-and-bobbin assembly), I contacted Joan Jones from Woodland Turnery. Joan and her husband Clive took over the Timbertops business when Jim and Ann Williamson wanted to retire, and I think they are doing a great job of it, too. You can read more about Woodland Turnery on the Wovember blog here. The chair wheel with its accelerator mechanism is ideal for production spinning, but the flipside is that it’s not really a beginners wheel. Luckily there’s a large whorl as well as the standard one, which means I can slow the wheel right down. I’m taking my time learning to spin on this wheel; every time I sit down with it, I not only appreciate it as a spinning tool, but also the workmanship required to make it, the beautiful oak it was made from, and all the spinning that has gone on before I had it. When I emailed Eileen to thank her for the wheel, she replied saying that “…I did have many happy hours spinning and I [was] most anxious for the wheel to find a good home with someone who would appreciate it.” Knowing how much this wheel meant to Eileen, I hope I will do her proud, and I’m looking forward to spending many happy hours with it. Oh my, you are one lucky Hollander! You will enjoy it. What a beautiful wheel! I can see why Eileen was anxious for it to go to someone who would appreciate it! Twelve bobbins! I have a feeling you will become a knockout spinner in no time! What you have there, Tom, is a squirrel cage skeiner. Enjoy your gorgeous wheel, Timbertops are indeed treasures. What a lovely wheel! And I know your skein unwinder as a squirrel cage swift… I wish I had one of those! What a beautiful wheel! And I love the sign with your name on it. I’m also a lefty. I think I spin right handed (i..e my right hand controls the fiber, leaving the left free to drink coffee when woolen spinning). Will have to try a left handed wheel some day to see if I’m inclined to switch. I have never seen a Timbertops wheel before and what a truly wonderful wheel it seems to be. May you have many happy hours together. 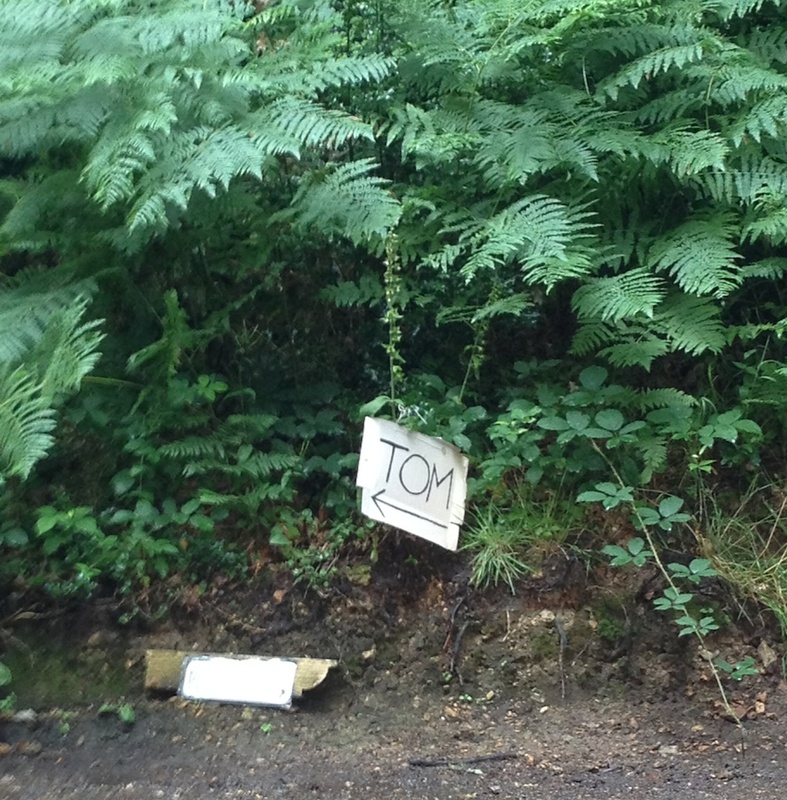 lovely wheel tom, happy spinning! Its a beautiful wheel. Happy spinning from one who has the spinning bug too! It is gorgeous! And I would very much like to know all about unwinders. Not only is it beautiful, I bet it makes a lovely sound too. Happy days. I reckon you might be about to fall in love with this wheel. There is something very special about your first wheel and this is a beauty. It might be all the wheel you ever need with its emphasis on production spinning. I have a 1974 Philip Poore upright Wendy. Not a great range, but such a pretty thing. It was definitely a first love experience! Tat is a truly beautiful wheel. It will inspire you to have many hours of learning and spinning enjoyment. Spinning and knitting are two delightfully quiet therapies for the soul. Oh,my! That is such a beautiful wheel. And all the accessories that go with it! Twelve bobbins. I don’t know what all I could do with twelve bobbins. I have a tendency to do small batches with my limited number of bobbins and that makes me ply in small batches. Twelve bobbins. What a dream!